I can’t put My finger on it, but the AR is quite High on that one. Have you perused the library? It does look familiar. I would be interested to see this all in one ring size and further expanded as a sheet. Might be that it's a strip of one of the unbalanced Euro weaves. I'm going to look around our library, if I find it I'll let you know! I have looked through the library, but the only thing that looks even close to it is this weave. http://www.mailleartisans.org/weaves/weavedisplay.php?key=706 I wonder if it could be a modification of it. 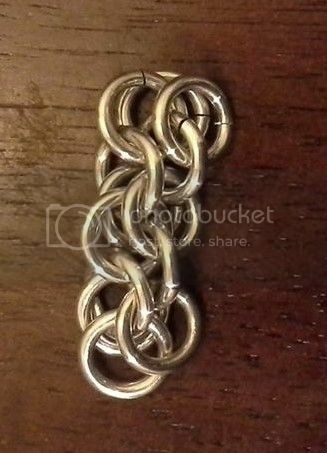 I "discovered" it by playing around with Dragon Tail and seeing what it would look like with more rings in it. Regarding Don’t hit your sister/I mean it; that badly needs to be split into Two weaves. Narrinna, would you be against duplicating it, tagging one chain and one Sheet? Oh and the ring sizes I used were 5/16" 16SWG in BA and 1/4" 16SWG rings in AA. I would actually leave it as one, the 'sheet' form is really just two chains bolted together. I'd prefer to see a true sheet form submitted than to split this one. Looks similar to the Moon Rover-ish family with 2 ring sizes. yeah its along the same lines as other stuff but it doesnt look that familiar to me. only way to know for sure is to go though all the weave pics. Attica already has a sheet and the band though so i dont see why it couldnt have a diagonal entry, I like the loose look though timefire, i wonder if it could be made to lay snug on the other face like you have it maybe with the paired rings big and the three ring part on the smaller side.. Sorry im not making use of the edit button but i guess this keeps my posts orgaized..anyway i tried some different ring sizes. this one is closer to the min AR with 14swg 3/8 and 1/4 so its pretty stable but it kinks up quite a bit. This is closer to the sizes you used Timefire at 14swg 3/8 and 9/32 but the small groups of three are a slightly smaller AR. even at this size it does shift around quite a bit but it could considered stable. this is pretty much the AR sizes you used Timefire in 14swg 3/8 and 5/16 for the diagonal Attica part but i added a 14swg 9/32 in the 3/8 in a barrel style which i think makes it reminiscent of Dancing Dolphin, it thickens it a bit but it is quite stable. @DJGM, Yeah that looks exactly like it. I first tried it in 3/8" 16SWG BA and 7/32" 18SWG BA rings, then tried it in 5/16" 16SWG BA and 1/4" 16SWG AA rings. i think its gonna be a hard one to stabilize flat like that with the two different ring sizes which is too bad because it is quite appealing laying on the table there.. Finally found what it reminded me of! It's very closely related to Mink Tail Weave only there the large rings have been interconnected. I think there might still be some unexplored potential here if you can find a way to keep it stable. Maybe play around with it a bit more and see what happens.